I had promised to do a retrospective this week on Marvel's Guardians of the Galaxy series back in the 90s, to go along with Back Issue Ben's Guarding the Galaxy series this week (which focused on the 2000s Guardians). But a week ago, Ben sent me some images for this particular Easter egg, and yesterday, Travis mentioned this story, so I took it as a sign to talk about this instead. Who am I to argue with destiny? Okay, in the latter half of the Spider-Man Clone Saga, Marvel launched a double-sized quarterly title called Spider-Man Team-Up, where Spider-Man, uh, teams up with various Marvel heroes. 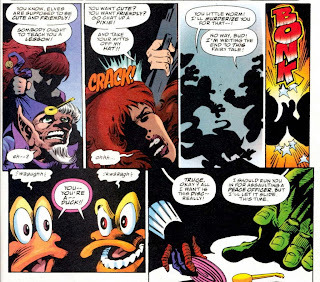 In the second story of issue #5, then-editor-in-chief Bob Harras told then-editor Tom Brevoort to bring back Howard the Duck. 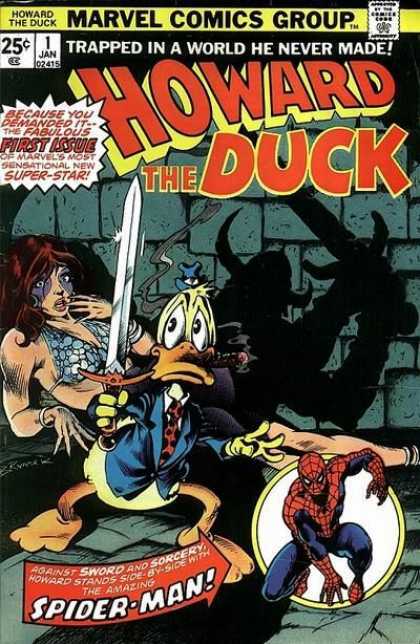 No writer would take the assignment, however, because they all felt that Howard's creator, Steve Gerber, should be writing it. 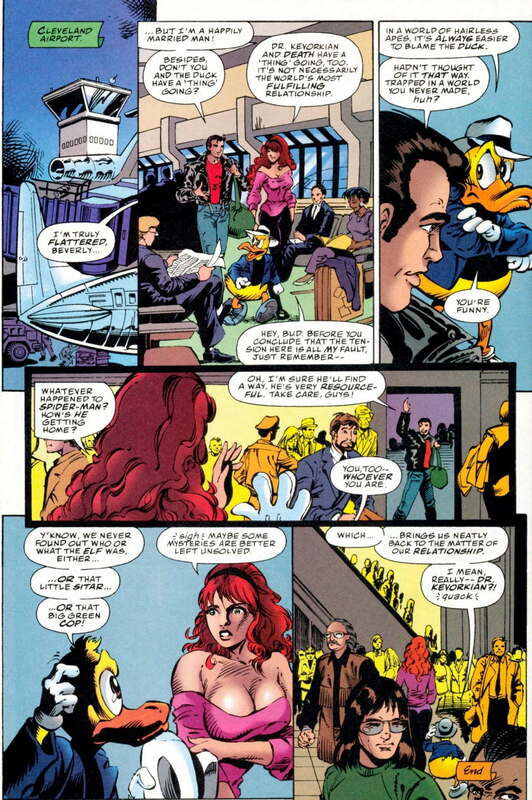 The ownership of Howard had, after a particularly arduous lawsuit between Gerber and Marvel, been awarded to the company. 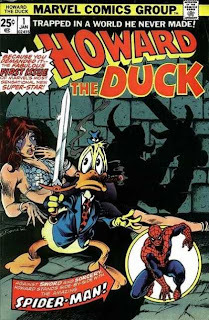 Gerber wanted to do an unofficial crossover, which wasn't unprecedented (DC and Marvel had been doing them since the 70s), where Destroyer and Dragon's adventure brings them right to Spidey and Howard. Brevoort liked the idea, and signed off on it under the condition that nothing Gerber was going to do was going to get him in trouble. 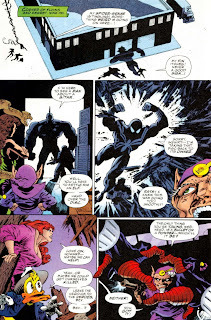 And apparently when Gerber found out that Harras wanted to use Howard in other titles as well, he got irked, but stuck to his promise to write the story. 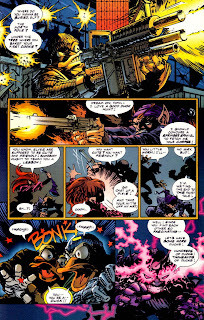 For the villain of the piece, Gerber brought back his old creation that's loved by fans of the 70s Defenders: Elf with a Gun. 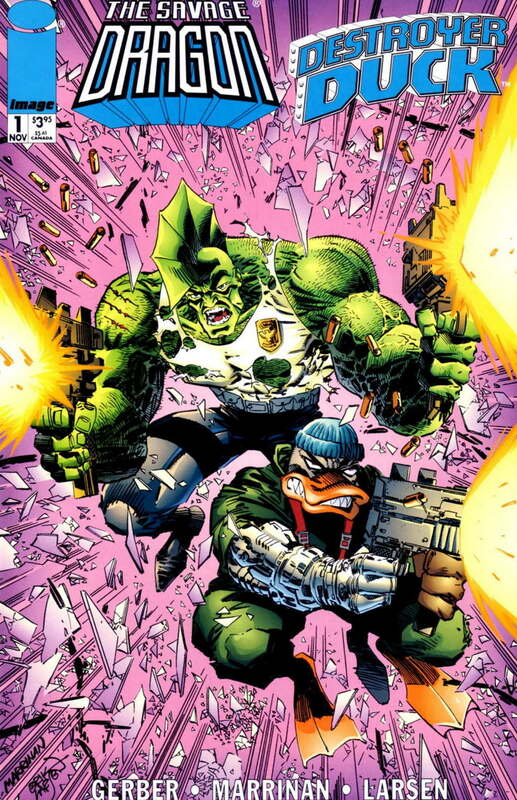 I know he's not holding a gun here. 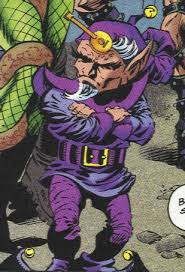 Why must you judge me? 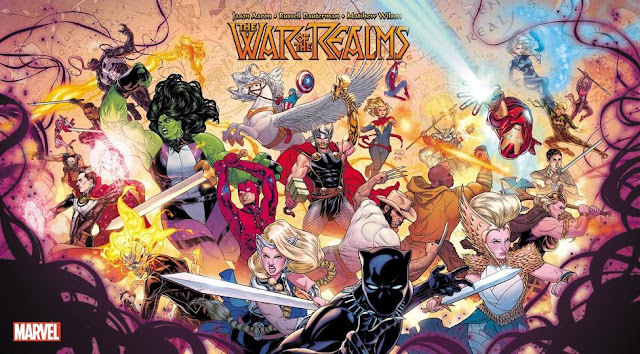 So in SMTU, drawn by James Fry, we've got all the heroes coming to the warehouse from Spidey's point of view and with Dragon and Destroyer obstructed. And over in TSD/DD, the view from the other side. And then TSD/DD took it a step further, with Elf with a Gun just cloning Howard, and then Destroyer and Dragon making off with "the real" Howard and his girlfriend Beverly Switzler. The ending to SMTU was pretty straightforward, although if you had no idea there was another comic "crossing over," you'd probably have been lost. But the ending to TSD/DD made it clear that Dragon and Destroyer had swapped out the "real" Howard and Beverly for a couple of imposters! The real Howard and Beverly are now going by Leonard and Rhonda, and have moved to Buffalo, NY — Gerber's best shot at "taking back" his creation. 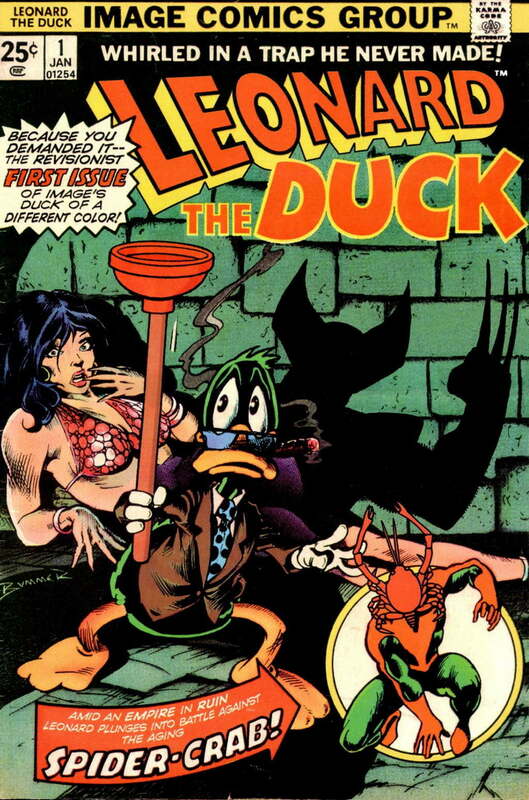 They even included a mock cover for Leonard the Duck #1, a takeoff of the original Howard the Duck #1. 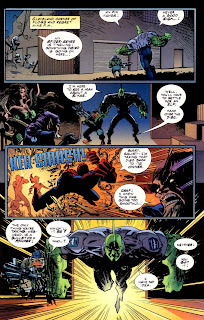 Needless to say, Brevoort was pissed, feeling that Gerber had deceived him and that he would undoubtedly lose his job for allowing it to happen. 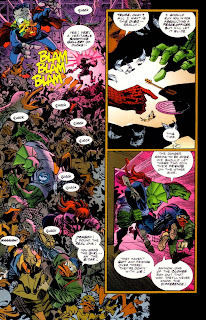 Fortunately for Brevoort, and unfortunately for Gerber, The Savage Dragon/Destroyer Duck was met with general fan indifference and low presales. 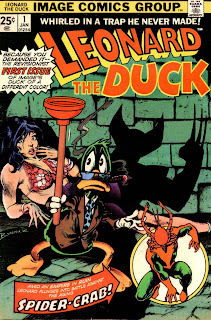 I thought it was a fun story, even with the chicanery going on behind the scenes.